La posizione privilegiata vi consentirà di raggiungere rapidamente i punti di maggior interesse turistico e storico che Roma offre. A solo 260 metri troverete la fermata della metropolitana Cipro. 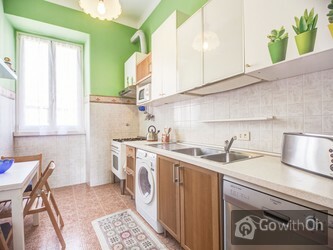 La zona, inoltre, è ricca di ristoranti e caffetterie dove potrete provare la vera cucina italiana. Dalle 21.00 alle 24.00, con supplemento di 20. Culla e seggiolone gratuiti su richiesta. 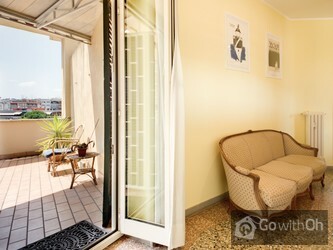 Très bel appartement spacieux, confortable et très bien situé pour profiter de Rome. idéal pour 6 personnes. Accueil très chaleureux et dévoué. A recommander. Un très bon rapport qualité/prix dans un quartier où on ne manque de rien (métro en bas, supermarchés également, bars et ...restaurants sympathiques à proximité). Réservation de taxi à l'aller et au retour. vacanza stupenda nonostante il tempo pessimo!! 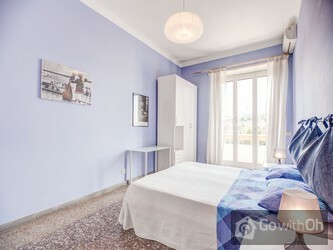 !Appartamento stupendo,con vista bellissima e molto pratica per visitare Roma!! !Il Sig. F gentilissimo !! 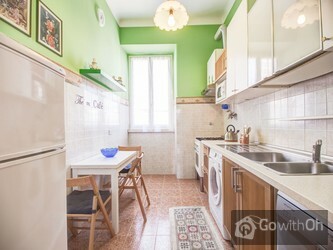 !Consiglio questo alloggio a chi vuol fare visita alla città di Roma !Grazie! 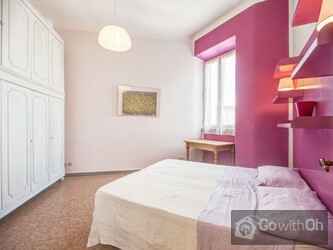 Nous avons été parfaitement satisfaits de notre location de cet appartement. Les personnes qui nous ont reçus sont des gens très sympathique. Le logement est parfaitement confortable et très proche du centre. Il faut savoir quil y a tout de même du bruit car le salon donne sur une place avec... beaucoup de circulation. Il y a aussi une petit manque de vaisselle par rapport au nombre de personne qui peuvent séjourner. Nous en garderons un très bon souvenir ! We had a great stay! 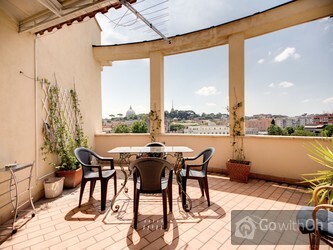 The apartment was exactly as pictured, clean, with a great view of St. Peter's cupola. 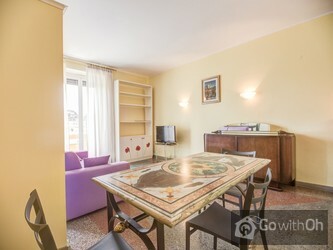 The owner was very helpful and took the time to show us where the metro, market, and tourist sites were on the nap in relation to the apartment. 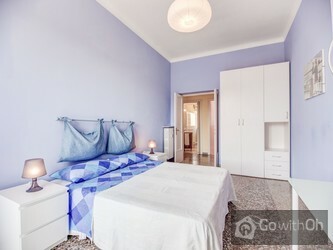 I highly recommend this apartment. We had a fantastic time during our stay in Rome. 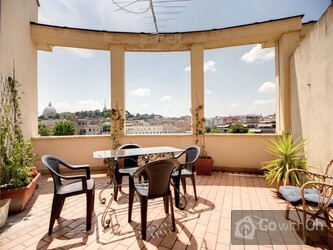 The flat was perfect, spacious, and clean with a great location and view of Saint Paul's Basilica. F. was an amazing host, going above and beyond to make sure that our stay was as comfortable as it could be. He met us at the flat, helped us with our ...bags and parking our car, gave us a map with directions to all the places we wanted to go, and let us know the local places to get the best priced food. He also checked in with us throughout our stay to make sure that everything was to our standard. 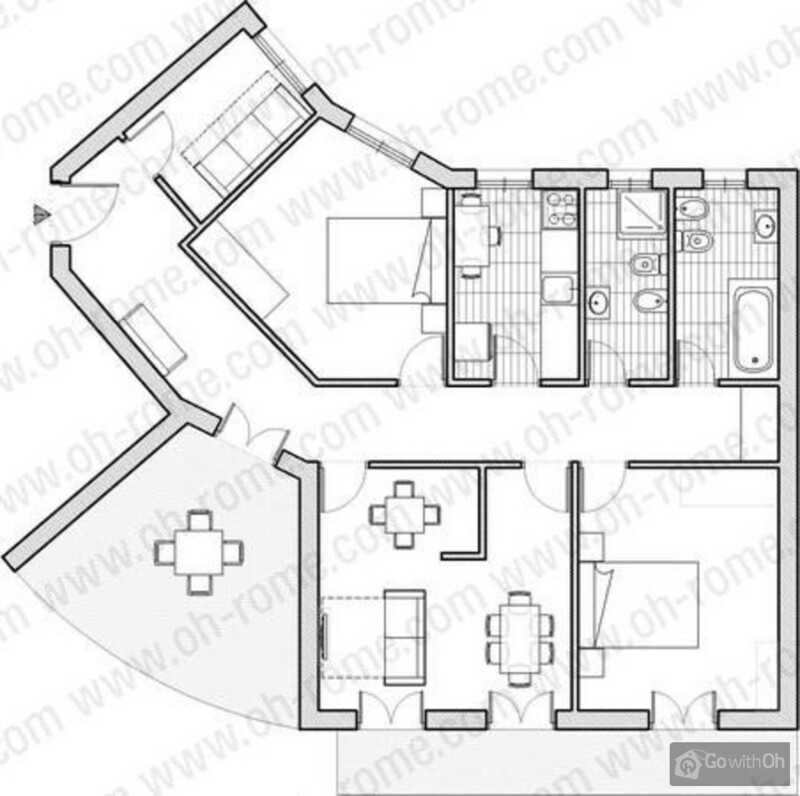 There wasn't a thing we would change about our stay in Rome and using go with oh to rent our flat there. 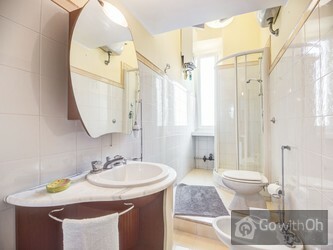 I will definitely be recommending this website and flat to any friends who are looking for the perfect place to stay. Nice Big apartment plenty of room for 7 people. Nice big balcony and great location. Die Wohnung war sehr sauber, könnte schon liebevoller gestaltet werden. 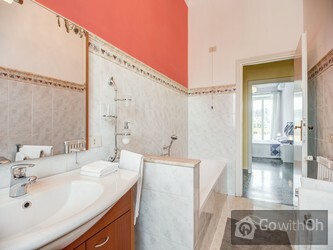 Wohnzimmer ist sehr nüchtern. 1 Sofa für 6-7 Personen (wir waren 4 Personen und konnten nicht gemeinsam sitzen) und kein Tisch. Die Kommode bestückt mit Abfall. Esszimmer ebenfalls sehr spartanisch: 1 Tisch + 6 Stühle. ...Küche war nur für das Allernötigste bestückt. 1 Geschirrtuch, keine Eierbecher, Kaffeelöffel genau abgezählt (wurden nachträglich geliefert) ..... Wir waren schon in sehr vielen Wohnung, aber alle waren besser bestückt. Der Balkon ist groß und hat einen schönen Blick. Polster auf die Plastikstühle würden es etwas gemütlicher machen. F hat sich toll um uns gekümmert. Un grand Merci à F.
Ligging is top, vlak naast metrostation Cipro en een supermarkt. 4 slaapkamers waarvan 2 aan de straatkant. Als je niet zo diep slaapt, heb je wel enigszins last daarvan. De andere 2 kamers zijn top. Le logement pourrait être amélioré par une clim dans les 2 chambres (côté cour) car des ventilos ne rafraîchissent pas l'atmosphère. La vaisselle est un peu archaïque ( peu de plats pas de bols et l'investissement dans une cafetière électrique serait judicieux) Bon emplacement près du ...Vatican et du métro. Oreilles sensibles, s'abstenir car la place est bruyante surtout la nuit. Hinweis, dass durch starken Verkehr, besonders Krankenwagen mit Martinshorn (Nähe zu Krankenhaus und Notfallambulanz) ein erhöhter Lärmpegel vorhanden ist, wäre nett gewesen. 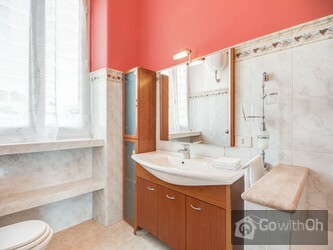 Lovely typical Italian apartment with all amenities required. F the owner was very helpful especially tracking down my lost luggage. Very close to the metro and just outside the Vatican walls..
F was a terrific host, meeting us graciously and taking the time to show us various routes and sites on a map he provided. The apartment was exactly as advertised, great location. Since it was August when we were there, we enjoyed the terrace only in the early morning (what a great place to have ...breakfast!) and in the evenings, once the sun was no longer shining on us. Being able to do some laundry before we moved on was a bonus (drying racks and clothes line provided). F ist sehr Freundlich und Hilfsbereit ,wir hatten eine sehr schön Zeit. Im Appartement ist alles vorhanden was man braucht. Gute Anbindung mit der Metro und Supermarkt in der nähe. Was will man mehr.